Posted January 16, 2013 by Josette Farrell in News. 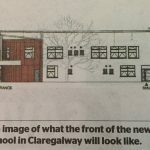 A planning application has been lodged with Galway County Council regarding the interim building for the proposed new Secondary School for Claregalway, Coláiste Bhaile Chláir, and a decision is due by February 19th. The planning section of Galway Co Council says anyone wishing to make submissions or observations regarding the project must contact them before January 29. 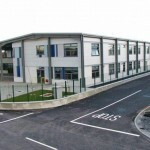 The application for planning permission for the building for the 350 pupil school was lodged on behalf of the Minister for Education and Skills on December 17. 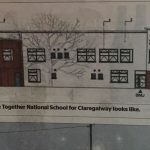 It states that the development will consist of a two storey temporary school building, housed within the existing structure of Unit 13 Claregalway Business Park. It will comprise seven specialist classrooms, 12 general classrooms, general purpose hall, kitchenette and servery, offices, staff area, sanitary and ancillary accommodation with a total floor area of 2,675 square meters. The proposed site works are to include provision of 15 car parking spaces via a proposed new vehicular access linked to the existing road infrastructure to the north of unit 13, which will include a bus turning circle and drop-off and pick-up facilities. External work will include two bicycle racks, the formation of three ball courts to the south and east of the proposed development and all external storage yard. The area surrounding the development will be hard landscaped and complete with new security Paladin fencing. The gross floor space will be 9,180 square feet. 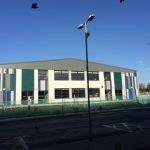 If the planning permission gets the green light next month, it is expected that work on converting the existing structure in a building suitable for a school will start soon afterwards. Already over 120 first year pupils have enrolled for Coláiste Bhaile Chláir which is due to open in September.